Potatoes don’t just make great fries! They can also power a clock provided you follow the correct method. Believe it or not, you don’t need any batteries or a source of electricity – you can simply use potato power to run a clock, and we will show you exactly how. If you are looking for a great science experiment to demonstrate the generation of energy and the flow of electrons, follow this guide and astonish your classmates! 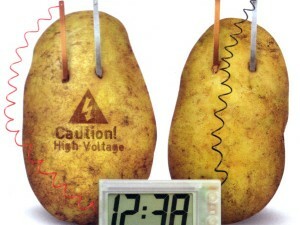 The Hypothesis for this experiment is that the juices in potatoes contain chemicals which can facilitate electricity generating chemical reactions with the help of electrodes. Start by marking the potatoes ‘1’ and ‘2’ using a dark permanent marker. This will help you better understand the following instructions. Begin with inserting one galvanized nail into each potato, pushing them half way inside. Now insert one copper nail into each potato, making sure that they are as far away as possible from the galvanized nails. This distance between these two nails is what will generate the electrical charge. Now take the battery operated LCD clock and remove the batteries while making note of the positive and negative terminals. Take one wire with alligator clips and connect one end to the copper nail in potato ‘1’ and the other end with the positive terminal in the LCD clock’s battery compartment. Now take another wire and connect it with the galvanized nail in potato ‘2’ using one end and the clock’s negative terminal with the other. The third alligator clip wire will connect the galvanized nail from potato ‘1’ with the copper nail in potato ‘2’, completing the circuit. Your basic LCD clock should now be working on potato power. How cool is that? -If your clock isn’t running, check the alligator clips and the connections properly. Your clips should not be touching any part of the clock’s battery compartment other than the terminals. -Sometimes a potato might not produce enough energy and your clock might require a high power battery, try switching clocks and potatoes. -If you want to verify whether your potato battery is producing energy, connect the alligator clips from the battery compartment with a multimeter. Each potato basically functions like a "galvanic cell", which releases energy (in the form of electricity) as a result of chemical reactions. The potato as a whole becomes the cell casing, its juice works as a conductor or electrolyte, allowing the flow of charged ions, and the phosphoric acid naturally present in potatoes provides the hydrogen ions (H+) for the chemical reaction.